Deb Jenny will be signing copies of Sleeping with Ward Cleaver from 1-3 p.m. on Sunday, April 13 at the Charlottesville, VA, Barnes & Noble. She’s appearing at a signing from 6-8 p.m. on Tuesday, April 15 at the Altoona, PA, Barnes & Noble. And she’ll be returning to her hometown for the wild and wooly Romantic Times convention in Pittsburgh from Tuesday, April 15-Sunday, April 20 (where she will undoubtedly sip cocktails with the esteemed Lisa Daily!). She’ll be holding a signing from 7-9 p.m. on Thursday, April 17, at the Barnes & Noble Waterfront in Pittsburgh. Lisa and Jenny will also be participating in the large 250-author book fair from 11 a.m. till 2 p.m. on Saturday, April 19, at the Pittsburgh Hilton. In addition, she will be appearing on Pittsburgh Today Live on Wednesday morning, April 16 between 9-10 a.m.
Deb Gail will speaking on a panel at the Pilcrow Lit Fest in Chicago on Saturday May 24th. She was featured on the Pilcrow blog this week. If you’re in or near the Chicago area this is an event you don’t want to miss! 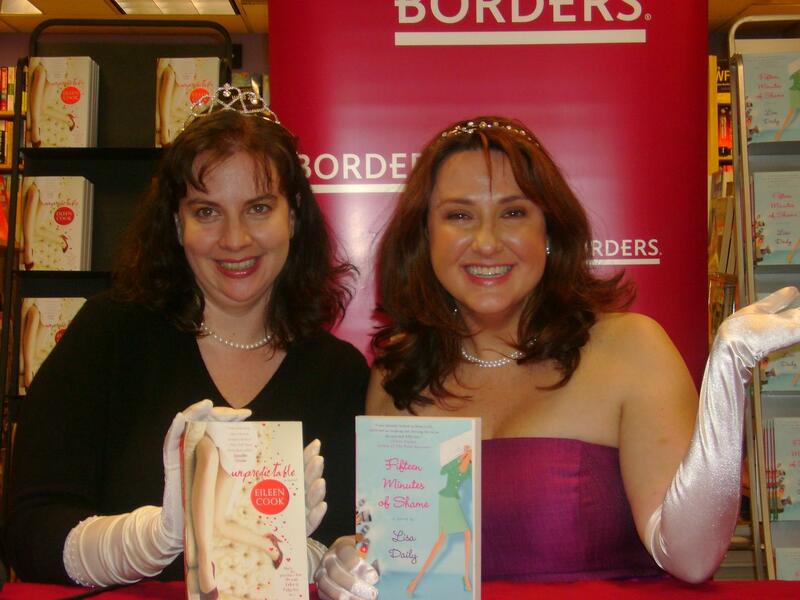 Deb Eileen and Deb Lisa hammed it up at their signing at the Park Avenue Borders — thanks to all who showed up! Deb Lisa &* Deb Jenny will be signing at the giant RT Book Fair with 250 authors. Lisa will also be appearing on Showcase Minnesota– NBC- 11 (4/14), The 10 Show (Philly 4/16), The CN8 Morning Show – east coast syndicated (4/16), and Good Day Atlanta (4/21) – Be sure to tune in! Winner of last week’s raffle of a copy of Julie Buxbaum’s The Opposite of Love is HRH, also known as June Cleaver Nirvana, a very fun blog if you haven’t discovered it yet. Yeah! I won! I won! *blushing* thanks for the kind words.